One reason for the Republican party’s expected gains in the upcoming election is the so-called “Enthusiasm Gap”. Even though the country is relatively split on certain issues, those who are against President Obama’s policies feel more strongly than supporters and are therefore more likely to vote. Conservative enthusiasm, as reported by CNN, is largely driven by the TEA Party (an acronym for “Taxed Enough Already” that pays patriotic homage to the Boston tea party). They claim to be protesting “out of control” government spending by the Obama administration. For more details on why their views are less valid than they appear on the surface, see Matt Taibbi’s article from a recent Rolling Stone. This post, however, is about the Tea Party’s views concerning science policy. First, let’s look at Tea Party endorsed candidate Christine O’Donnell, who is running for Senate in Delaware. The Conservation Report has a great post about her scientific views, which I will borrow two YouTube videos from. It is worth noting that Christine O’Donnell defeated Mike Castle in the Republican primary. Until that point, according to the Guardian, Mike Castle was the only Republican candidate who was not a global warming denier. Let me repeat that- only one Republican candidate was not a global warming denier. He lost, largely due to Tea Party “enthusiasm”, to someone who believes both that evolution is false because we still have monkeys and that scientists have created a half-mouse half-human hybrid. It is arguable that President Obama’s proposed solution to climate change (a cap and trade policy) is big government, and therefore it is possible to oppose it because you’re against big government and not because you are anti-science. However, these candidates (and their supporters) are not claiming “yes, climate change is happening, but cap and trade is an overreach of government authority”. They are denying that climate change is happening at all. Yet another relatively-moderate Republican (i.e. one of the few who doesn’t deny the overwhelming amount of scientific data supporting climate change) was ousted by a Tea Party backed challenger. This time, the moderates views concerning climate change were actively used against her. Climate change issues aren’t the only scientific policies that Tea Party members are involved in. Many are also religious conservatives who have long held anti-science beliefs. “Christian conservatives, a key element of the Republican coalition for more than three decades, are actively seeking reassurance that they are not going to be displaced. Last week, one key Tea Party strategist, Matt Kibbe, felt compelled to tell reporters at a breakfast meeting that “the Tea Party movement is not anti-religion”…. The Tea Party movement is anti-science. 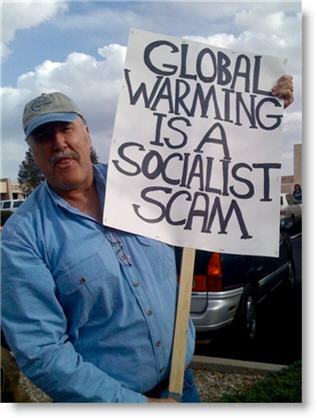 They believe global warming to be a hoax. They believe that evolution isn’t real. They are against stem cell research. They are against science-based regulation. In our political system, decisions are made by those who show up. The outcome of the 2010 midterm election will affect United States science policy. Regardless of your views on government spending, people who care about science policy should reject the Tea Party. Thank you for sharing this, David. It was tweeted by @BoraZ and caught my eye, so I visited your article (I’ve been to your SFS site before, but this is my 1st comment). FWIW, I retweeted it, as it’s a point well worth hammering home. If these TP’ers are elected en masse, I’m afraid we’ll see the kind of fight the UK is seeing now (reference the “Science is Vital” protest and discussion of late). Nice post. I had one brewing on this, but I’ll just send folks here instead. Something i find deeply upsetting is (and highlighted in the RS article you link) is that the driving force behind this is pure greed. “They” will do anything to stay in power and keep getting richer and that means ‘sacrificing’ the planet by sponsoring climate change denialism and actively working to keep people dumb (evolution deinalism and so on). I think it was Rove who was recorded saying that all they needed to do was keep people dumb and scared. From a distance (Australia) the Tea Partiers seem to me to be a classic case of ressentiment against modernity. That is, they dislike having to adapt to novel ideas and to abandon some vague network of values and ideas they were raised with. It is exactly the same ressentiment that motivates the Islamists. They just do not like the modern scientific, technological, and social world. And this is not entirely an act of stupidity, although it seems that stupidity is a virtue in these movements (“Know Nothings” spring to mind). It is an act of protecting one’s cultural investments. Simple opposition won’t defeat these movements; but incorporation of their core values into the modern world, making a space for them, may help lessen the virulence of their acquired ignorance. What I find ironic is that many of the early heralds of what was to become “tea party” politics claimed to base their positions on reason and logic, and that “leftists” were all about emotion. Embracing the desire to continue to pollute, perhaps giving in to recycling when it is convenient, is to me a politics based on emotion. Even holding to a “conservative” economics, cutting taxes and services, is based on the emotional desire to identify with the wealthy whose taxes are being argued. I can see what you’re saying, but I think your concern is overblown and the call to arms is misdirected. First off, some of these candidates really do make me shake my head. Some of them will win. Still, they’re not actually going to be in charge of anything. Even if every single extreme candidate on the right wins, there will only be a handful of them. O’Donnell isn’t going to be in charge of science education just like Hank Johnson (D – Guam tip over guy) isn’t going to be in charge of troop levels at various bases. Angle isn’t going be influencing climate policy just like Maxine Waters (D – wants to nationalize oil production) isn’t going to be in charge of setting energy policy. Instead of worrying about any kind of Tea Party takeover, scientists should spend their energy doing a better job educating the general public. Scientists have some real work to do when well meaning activists make predictions about climate change that far exceed the actual science. Our failure to rein them has made a big contribution to the lack of ‘belief’ by the general public. Scientists have some actual work to do when only 20-25% of the general public is “scientifically savvy and alert”. Until scientists do a better job of communicating basic scientific principles to the general public, we’re going to have our hands full. Those abysmal statistics fall on the shoulders of scientists and science educators (many who work at Universities are both). Each side of the political spectrum will have nuts that scare the other side. However, those people don’t end up setting policy or influencing big decisions. If we can improve general scientific literacy, a few politicians at the extreme right (or left) won’t be anything to worry about. While it’s too early to speculate what committees O’Donnell will serve on if she wins, any member of congress has a great deal of influence in this country. Also, Hank Johnson serves on the Military Personnel subcommittee of the House Armed Services committee, so he has a great deal more influence over troop levels than most elected officials do. The climate bill died in the Senate because Democrats fell a few votes short of 60. Every single vote makes a difference. Senator James Inhofe (R-OK) is famous for claiming that global warming is the “greatest hoax” of all time, and Republican leaders put him on the “subcommittee for clean air, CLIMATE CHANGE, and nuclear safety”. Yes, people with extreme views often get to influence policy in the very arenas where their views are so extreme. Scientists absolutely need to do a better job educating the public. That doesn’t mean that we shouldn’t object to anti-science extremists gaining political power in this country. Let me put it bluntly. If scientists did a better job of teaching people about science, no one would vote for these idiots. As long as people are ignorant about science, they will elect people who are ignorant about science. We can try to fight them candidate by candidate, or we can push for an informed electorate. Which has a better chance for success? The climate bill died because the public is against it and they let their representatives know. Again, educate the general public and the rest will take care of itself. Scientists have to look in the mirror and admit that we have failed on this and there are consequences. In the mean time, we have a nice little experiment going (if lacking replication). Some of these people will win. Check back in 2 years and we’ll see how many of them have had a substantial influence on science policy. I think that’s a bit of an oversimplification. There are lots of reasons why people support political extremists and few of them have to do with how good their high school science teacher was. Why is it that we have to choose one or the other? I’m a big believer in improving science education in this country, but I don’t think it makes a lot of sense to abandon all other efforts to advance pro-science policy in the meantime. I hope you’re right on that last part. I had no idea that scientists can cut through decades of bad teaching mandated by school boards ran by political zealots immume to hearing voices that either aren’t in their heads or in agreement with the voices in the head, extreme religious indoctrination, confirmation biases, and bandwagon fallacies for which people nearly always like to fall, and simply talk their way to a scientifically literate public. Obviously, none of the things above is a major problem to teaching science. It’s just those socially inept scientists doing such a bad job at teaching. If the local mandates from school boards are the problem, why are we concerned about the scientific views of federal candidates? I’m not sure where you got socially inept from? All I’m saying is that if scientists want to have a political impact, we should start by making sure the public is educated about science. That’s a much better use of our time than grousing about some candidate in a race that very few (if any?) SFS readers can vote for anyway. 6000+ readers from Delaware this week, you tell me if you think the 20 minutes Dave spent writing this article was wasted. DE race has a 10 point spread in polling. Analysts have been calling is a Solid Dem win for a month now. 60,000 readers aren’t going to make a difference in that race. Fighting them candidate by candidate, of course. What, you think we’re going to change the entire US political zeitgeist by November 5? Check back on Wednesday morning (or in 2 years) and let me know how things are working out with your strategy. The die is cast for this election cycle (and probably a few more after that). We spend so much time teaching kids whatever is popular at the time (rainforest 15 years ago, wetlands 10 years ago, going green now) that we’re neglecting basic scientific knowledge. Ask some 10-12 years old kids if they know the 3 R’s. Then ask them why oceans have tides. I bet they know the first, and I bet their answer to the second will make you sad. So put your money where your mouth is, and send a few hundred kids out to the SC Barrier islands through our Donor’s Choose Initiative. Last year, 1400 students got a boost to their science education thanks to readers who come for the political shenanigans, hilarious boat brews, and pictures of dolls but stay for the marine science with a twang. Hey Folks, Fantastic site! I’m an ecology/biogeochemistry post-doc at U-Illinois, and am making sure to let everyone know about this site. I’m a proud yankee, but keep it up y’all! My advice to you, SFS, is to remove yourself from the political arena. By entering that debate, you open yourself up to the charge of using science to enforce your political leanings. I’ve been a scientist for about a year – and a citizen of this country for 45 (mid-life career changer). I have observed powerbrokers attempting to claim the “infallibility” of science as a manner of legitimizing their beliefs. We know how THIS one will work out, don’t we? Don’t become a victim of this ethic. Remove yourself from the discussion about “how to govern” and you will better suit our mutual cause. Shorthand summery: Scientist have widely different opinions on this issue (and they should!). But we all agree that science education is critical, and, at some point, it’s not enough to be a good teacher, you also have to have students. As to the impression of science being infallible, I think we need to make sure that people know that science is fallible. Science isn’t a set of rules, it’s a philosophy of discovery, understanding, and revision. The better science education is, the less likely the public will fall victim to these “powerbrokers”. I don’t think it’s a good idea for those who are most informed about an issue to remove themselves from the public discussion of that issue. You’ll note I haven’t written anything about health care or foreign policy. As a scientist, I am commenting on United States science policy. p.s. About sending the kids to camp…. Does ANYONE really think the scientific communty should not get politically active??? that is possibly a greater difficulty as we are clicking these plastic keys, people are starving and killing each other at our behest and though we care, there is nothing we can do about it. of course these strange biblical irrationalists do appeal to a lot of people who have vegetables for brains and so it may be a self fulfilling prophecy…which is scary. I think we should worry about the Pacific Northwest. The midwest sprung a leak in Montana and Idaho…Oregon is filled up with bible thumpers. Where is Bob Marley when we need him? I take offence to your insinuation that those of us who have faith (I am a born-again Christian)are somehow inferior or less intelligent than an “enlightened” Darwinist. As a scientist (BScPharm Manitoba ’99) I find no contradictions between my faith, a young earth, and creation. I know this may sound far-fetched, especially with the pervasive assumption that the theory of evolution is accepted by much of the scientific community as fact, and anyone who opposes this is vehemently labeled as some back-water hillbilly hack with “vegetables for brains”. The book of Genesis IS the truth, it defines our role as humans we’re called to have dominion over the earth and its creaures – a stewardship which we have obviously failed miserably. This intended dominion was not meant that we should exploit and destroy (as I know many of my fellow Christians have demonstrated – to my chagrin and dissapointment) but that we should look after this world and everyone and everything on it and in it. Please don’t “lump” us all together – I have worked successfully with others in several ares of environmental and social concerns with others whom I disagree with politically and otherwise, but we worked together on common issues to defeat a common enemy. Look to build bridges and reach out – not to slam someone’s fundamental beliefs that you obviously do not understand, while in the same breath calling THEM intolerant. Evolution IS a myth. This pseudo-science has as much validity as fluoridating water supposedly because adding this toxin is supposed to be “good” for you. Why is Bill Maher an expert? He is just a pathertic intlerant angry little man. What are his credentials? Being a myopic, opinionated talk-show host gives him some special insight? Christians, for hundreds of years have ADVANCED science, not suprressed it as much of the world today now believes. It is evolution and its proponrnts taht actually stagnates moving forward into wondeful new discoveries and understanding. Read the just-released “The Greatest Hoax on Earth” by Dr Jonathan Sarfati – and give real science a try – with false assumptions and half-baked unproved assertions by the likes of Richard Dawkins. Do you have any evidence to back up your accusations? Setting up pop-culture icons as if they were the gate keepers of evolutionary theory is a pointless pursuit. Who cares what Bill Maher thinks about evolution? Read SJ Gould’s “The Structure of Evolutionary Theory” and don’t fall for the half-baked platitudes of science-deniers whose goal is not to seek the truth but to validate their own preconceived notions. Christians, for hundreds of years have ADVANCED science, not suprressed it as much of the world today now believes. As have Jews, Muslims, Hindus, Atheists, Shinto, Buddhists, Deists, Taoists, Zoroastrians (and those are just the scientists I’ve worked with in the last 3 months). All that proves is that reality doesn’t favor any specific religious doctrine (or lack thereof). Since the beginning of humanity there was people who are are backyard and do not cant to see the reality under their nose, it’s so unsettling. Climate science with all the proofs concerning the climate change and the disappearance of the flora and fauna has to be politically aware that we are living in the time when we must fight for the sake of the planet and shut the mouth of the retrograde, greedy and cynical politicians.